Throughout this document, the Intel® Core™ i7, i5, and i3 desktop processor series, Intel® Pentium® processor family desktop, and Intel® Celeron® processor family desktop may be referred to as “processor”. Throughout this document, the Intel® 6 Series Chipset Platform Controller Hub may also be referred to as “PCH”. The term “DT” refers to desktop platforms. 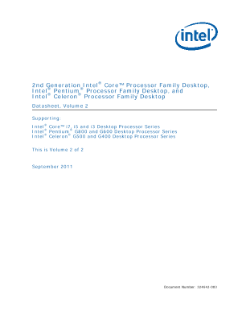 Read the full 2nd Generation Intel® Core™ Processor Family Desktop Datasheet, Vol. 2.